Read this: WinZip is not free and the code is only working if you have a registered(no trial) copy of WinZip. 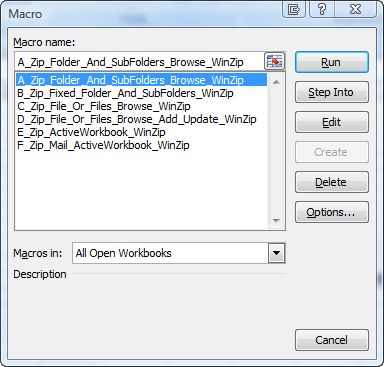 See the Zip (compress) section on my site if you want to use a free program like 7-zip. I really like 7-zip so check out my 7-zip pages if you are looking for a good free alternative. The code example on this page are using Shell to run winzip32.exe from the command line. supported since the release of WinZip 9.0 SR-1 in December of 2004. But they are still working OK.
Read the information about the undocumented parameters in this text file. For WinZip 12.1 and up there is a WinZip Command Line Add-in available which would allow you to perform many sophisticated actions from a command prompt, batch file, or other script. Check this out if the code on this page does not do what you want. Note: If you use version 12 you see that you have a option to use the extension .zip or .zipx (best compression). So it is possible that you must change the extension in the code to .zipx. I have add all the code in a txt file on my site so it is easy to copy it in a module of your workbook. When you use the shortcut Alt+F8 now you can see and run the macros.